Median Line Analytics is a method of technical analysis of financial markets used by TradingMotives. The method demonstrates many of the techniques that were developed through the work of Roger Babson and Dr. Alan H. Andrews (who developed the Andrews Pitchfork). Median Line Analytics monitors price behaviors and can be applied for deciphering market charts for both trading and for investing. You don’t need to be familiar with the Elliott Wave Principle to use Median Line Analytics. The methods can be applied effectively on their own merits. However, if you are familiar with Elliott’s work, the application of Median Line Analytics on wave pivots helps to make the interpretation of wave counts more objective. Median Line Analytics is also invaluable for real time interpretations, which is one of TradingMotives edges. Elliott’s channeling guidelines can only be applied to motive waves and to zigzags. Median Line Analytics can be applied to all motive and all corrective patterns (including diagonals, zigzags, double zigzags, triangles, flats and complex combinations). Median Line Analytics and the Elliott Wave Principle are valuable techniques for helping to forecast potential future price projections as well as defining parameters that are critical for risk evaluation, so a combination of both methods is very powerful. Median Line Analytics helps to outline a “roadmap” for price on market charts. The terminology “analytics” is used because it is forward looking as opposed to “analysis” (or back testing) of historical data. The Andrews Pitchfork drawing tool is used in the analytics and this tool has two variants known as a “Schiff” and a “Modified Schiff”. 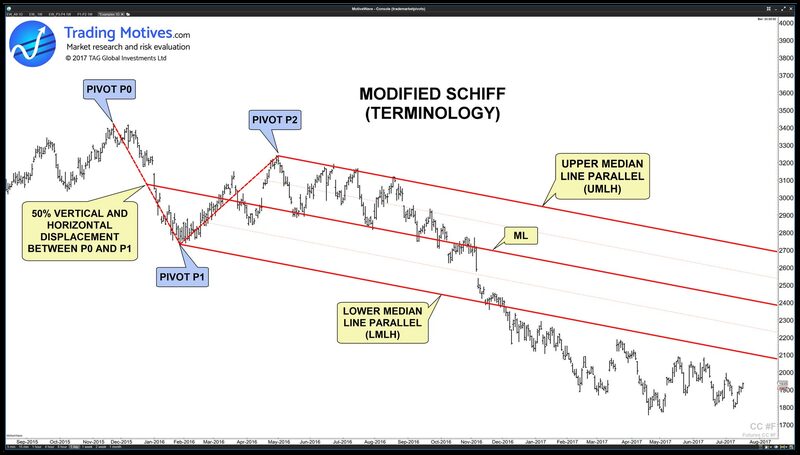 For simplicity, TradingMotives refers to the entire Andrews Pitchfork as a “Median Line” because that is the most important element of a pitchfork and for the variants, use “Schiff” and “Modified Schiff”. To draw a Median Line, use three alternating significant pivots that represent key swings in the timeframe being analysed. Label the significant pivots P0 (origin), P1 and P2. Dr. Andrews became an educator and one of his students (Jerome Schiff) came up with a hypothesis. In examples where price is in a shallow trend, the pitchfork was too steep and did not give valuable information about price behavior. He devised an adaption to the Andrews pitchfork to fit price more effectively and this is known as the “Schiff Pitchfork”, or “Schiff”. In this adaption, the start of the fork is shifted vertically by 50% of the distance between P0 and P1. A Schiff is shown in this chart. 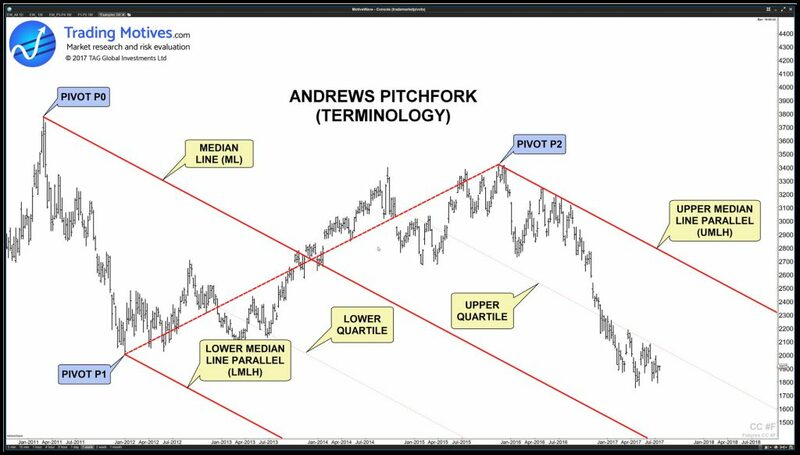 Dr. Andrews developed the “Modified Schiff” which is where the origin of the pitchfork is shifted both vertically and horizontally by 50% as illustrated in the chart. The Schiff and Modified Schiff variants are used in situations where they produce the “best fit” to the price action relative to the three significant pivots. 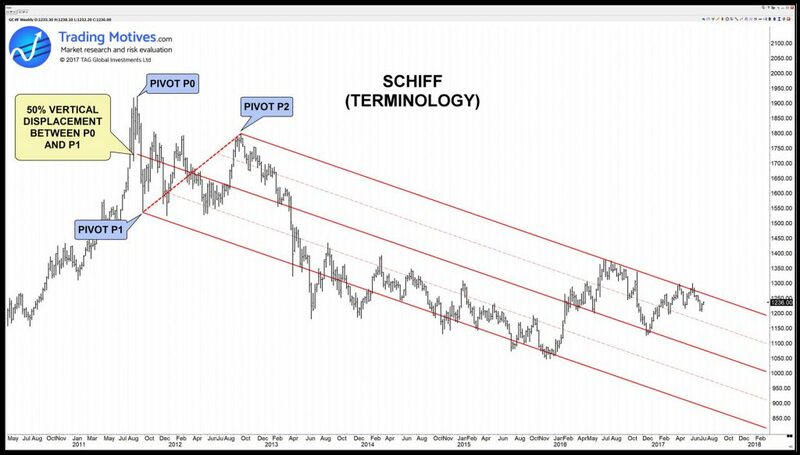 When an initial retracement occurs following the end of a trend, TradingMotives often use a Modified Schiff as soon as P2 is defined. Then monitor price behavior as it unfolds from P2 before deciding whether to change to another type of median line. The key is to find “best fit”. Price action and reaction can often be observed to occur along lines that are parallel to the Median Line (but not on it). Apply Sliding Parallels (SH’s) to monitor this. 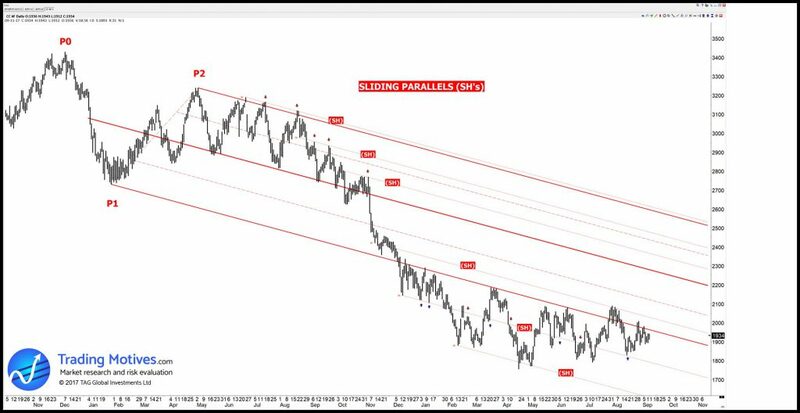 The sliding parallels are very important for detecting changes in price behavior. Sliding parallels generally define lines of action and reaction. They might initially act as resistance, but when they are breached, look to see if they act as support (and vice versa). Sliding parallels not only monitor changes in price behavior, but also help to define future support and resistance levels, which in turn, is relevant for evaluating risk and determining entry and exit orders and stop loss levels. Warning lines (WL’s) are drawn parallel to the median line and can be equidistant to the quartiles. These are used as reference lines to look for potential zones of action and reaction along the lines when price has breached the upper or lower parallels. In this example, you can see price action and reaction to first warning line (denoted by arrows). 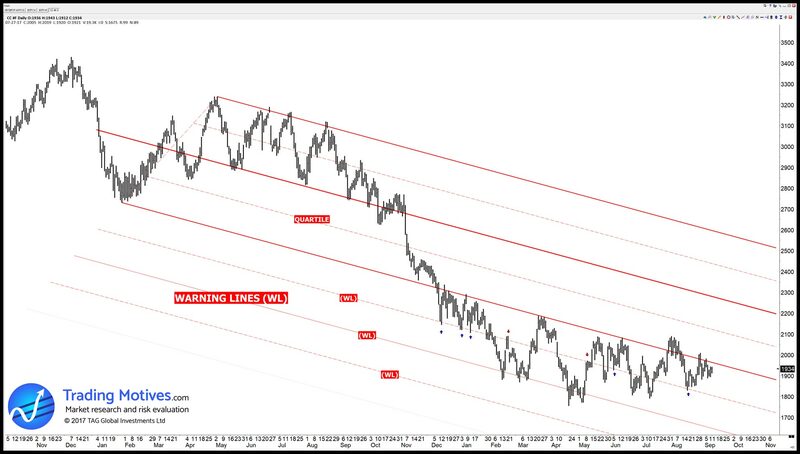 TradingMotives normally show the WL’s as faint lines so that they don’t dominate the chart and if price is overlapping the warning line by a small amount (like in the example) then we prefer to use a sliding parallel to pick up the actions and reactions with more accuracy.